Whether or not a new conservatory requires planning permission depends on several factors, such as its size, location and the type of your property. 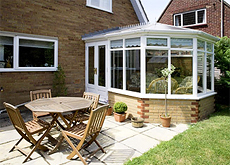 A conservatory may fall within your permitted development rights (not requiring planning permission) subject to it meeting certain restrictions. In this instance you will require a Certificate of Lawful Development, which details the proposed conservatory. Should your proposals for the conservatory exceed these limits, or if your permitted development rights have been removed, you will require full planning permission before installing a conservatory. As you may already know, all formal planning applications with the local authority must be accompanied by a full set of scaled architectural drawings. The purpose of these drawings are to clearly detail the existing building and the proposed changes of the conservatory and any other changes. Drawing and Planning are specialists in creating planning drawings and processing planning applications. Our architectural designers use the latest Computer Aided Design (CAD) software to create the clear and definitive planning drawings you will require for your application for a conservatory. As our consultants constantly review the planning legislation, we know what proposals are likely to gain approval and design our drawings to meet these regulations. Providing the Duty Planning Officers at the Local Authority with clear drawings of your proposals gives them an insight into the development and helps them reach a decision with ease. As a planning consultancy focused on getting you planning permission, we only ever take on projects for which we are confident we can gain approval.